The Lourdes Foundation is honored to host His Holiness the 14th Dalai Lama's special visit to the City of Angels, coinciding with Auge Media’s 60th Anniversary. This celebratory publication will honor Los Angeles — a magnificent “country” within a country. Sponsored by The Lourdes Foundation, this special edition coffee table book will include a gathering of influential leaders from Los Angeles; all proceeds from the sale of the book will benefit the Foundation’s work locally and internationally. Sean Lourdes, Philanthropist and President of Auge Media, says his life was dramatically changed by a personal encounter with His Holiness the Dalai Lama. The Lourdes Foundation, which he chairs, is dedicated to enabling positive social change by sharing opportunities and values that match the ideals of integrity, peace and compassion, which His Holiness often imparts in his public talks. Lourdes hopes to share his transformative experience of being in the company of His Holiness the Dalai Lama with the people of his hometown, including the city’s most influential leaders. “I believe that fundamental changes can begin in a diverse metropolis like ours,” Lourdes said. He is most grateful to The Venerable Lama Tenzin Dhonden for his enlightening guidance in making His Holiness’s visit to Los Angeles a reality. As part of His Holiness’ visit, a Public Talk will be held in order to reach out to the greater Los Angeles community. “The Public Talk will focus on sharing the value of social integrity,” said Lama Tenzin Dhonden, the Personal Peace Emissary to His Holiness the 14th Dalai Lama, under whose guidance this special visit is organized. “This event will be open to the public and the theme will be non-violence and the effects of compassion in the 21st Century. It is hoped His Holiness’s words will make a significant contribution to minimizing the stresses people face in today’s world, where financial environmental and social conflicts are constant,” Lama Tenzin Dhonden continued. His Holiness the Dalai Lama was awarded the Nobel Peace Prize in 1989 for his non-violent struggle for the liberation of Tibet. He has consistently advocated policies of non-violence, even in the face of extreme aggression. He is also the first Nobel Laureate to be recognized for his concern for global environmental problems. He was awarded the United States highest civilian honor, The Congressional Gold Medal in 2007 and in 2012 received The Templeton Prize which honors a living person who has made an exceptional contribution to affirming life’s spiritual dimension, whether through insight, discovery, or practical works. Since 1959, His Holiness has received over 84 awards, honorary doctorates, prizes, etc., in recognition of his messages of peace, non-violence, inter-religious understanding, universal responsibility and compassion. His Holiness has also authored more than 72 books and travelled to more than 62 countries spanning 6 continents. He has meet with presidents, prime ministers and crowned rulers of major nations and held dialogues with the heads of different religions along with leaders of science and industry. 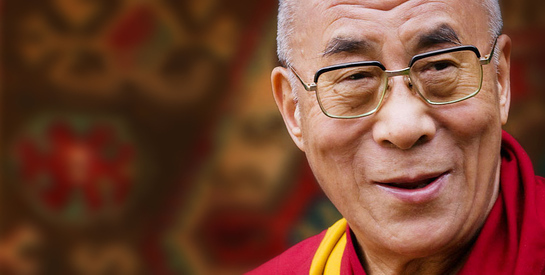 His Holiness the 14th Dalai Lama’s remarkable visit to Los Angeles will provide a once in a lifetime opportunity to hear the teachings of a man who understands the significant impact values such as social responsibility and compassion can play in daily life. 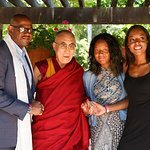 “The more people who hear His Holiness the Dalai Lama’s message, the more impact it will have in Los Angeles and internationally,” said Lourdes, who describes Auge’s philanthropic coffee table books as positive press. Details, including information on obtaining tickets to the February 25th event and how to purchase Auge Media’s Special Edition Philanthropic Coffee Table Book honoring Los Angeles will be released soon.